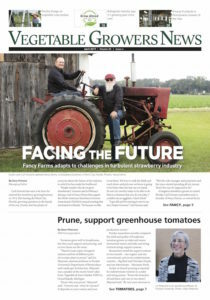 California Giant Berry Farms has strengthened its four-berry program for strawberries, blueberries, blackberries and raspberries, and is celebrating a collaboration with a vegetable packer. California Giant Director of Retail Sales Nick Chappell (top photo) recently visited the company’s Central Mexico operations covering more than 1,300 miles of ground to meet the growers. The company also kicked off their newly implemented winter cross-docking collaboration earlier this month with a vegetable packer, Mann Packing in Yuma, Arizona. California Giant customers can now load their vegetable and berry orders while in the desert. Cross-docking refers a logistics practice of distributing goods between trucks with little-to-no storage or handling time. California Giant reported a much needed rainfall swept California last week and brought the Salinas-Watsonville season to an end. Berry volume remains strong and steady for California Giant as Mexico, Florida and South America contribute to the fall-winter months with an abundance of fresh, quality berries.